We definitely fancy your chances with this one! It's not just about the betting and the racing, although that is exciting enough. Choose from a Grandstand, Paddock or General Admission ticket, with various catering options available. We definitely fancy your chances with this one! 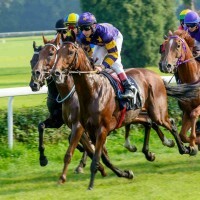 A day or evening at the races is not just about the betting and the racing, although that is exciting enough. Drink champagne and eat canapés , dress up in your racing finest or go casual and have a sausage roll and a beer, it's all part of the fun. We'll book you in for entry to any of the major UK horse racing venues. Choose from a Grandstand, Paddock or General Admission ticket, with various catering options available. Let us customise the perfect day or race night. Available as part of the Race Day Package, including accommodation. Date availability is subject to the http://www.britishhorseracing.com/race-info/fixtures/find-a-fixture/ which you can check here. Get in touch with the race course name and date and we'll build your ideal package.